Today I wanted to do a little review and explanation of my beautiful new addition; one of Saint Laurent's classic shoulder bags; the 'Classic Medium Monogram Saint Laurent *pauses for breath* Tassel Satchel in Black Crocodile Embossed Leather', or more colloquially known as the Saint Laurent Tassel Bag. Before I go into it, I just want to make it clear that this was a gift from my parents. I certainly don't want to give you the impression that I'm in the position to be dropping this kind of money on a handbag. I do make some money from blogging - the amount varies from month to month, but again, it's not on the buying myself a designer bag scale. Hell, I still need a few minutes to recover from the shock after paying for a full tank of petrol, and I've done it hundreds of times. I don't want you to think I'm sitting in a fort made of gifted Urban Decay Palettes and lighting cigars with £100 notes. I do however, know that I'm very fortunate, and I am hugely appreciative and am grateful that my parents treat me to the occasional gift. So, when choosing my next addition, I knew I had to be careful because I can be very fickle; I loved the Celine Tote and the Chloe Drew, but not enough. So, for about 9 months I'd been spying and heart-eye-emoji-ing all over this Saint Laurent piece on the arms of Emma, Sammi & Isabella - all demonstrating it's versatility through different styles and seasons. It's classic and stylish, but a bit more *edgy* than my beloved Chanel. Although *edgy* I am not, I thought I'd just about get away with it. Mine was purchased from Selfridges - the larger size (the one shown here) is currently out of stock but you can find the smaller size here at Selfridges. Alternatively there is always, of course, the YSL website. If you you'd like to see how I've styled it thus far, take a look at this blog post. The bag is 9.4 by 5.7 inches and 2.1 inches deep. The chain handle is 18.7 inches and the bag falls just around hip-length on me. It also has a handy interior slot pocket which is the perfect size for keeping your phone. Made in Italy; it's 100% calf-skin leather with a suede lining. The bag's exterior has been beautifully created in the style of crocodile skin, and I personally favour a textured leather as if you were to scratch the bag, it's much less noticeable. I worry much less about using a textured bag than I would a smooth textured bag. All hardware, both exterior and interior, is silver. 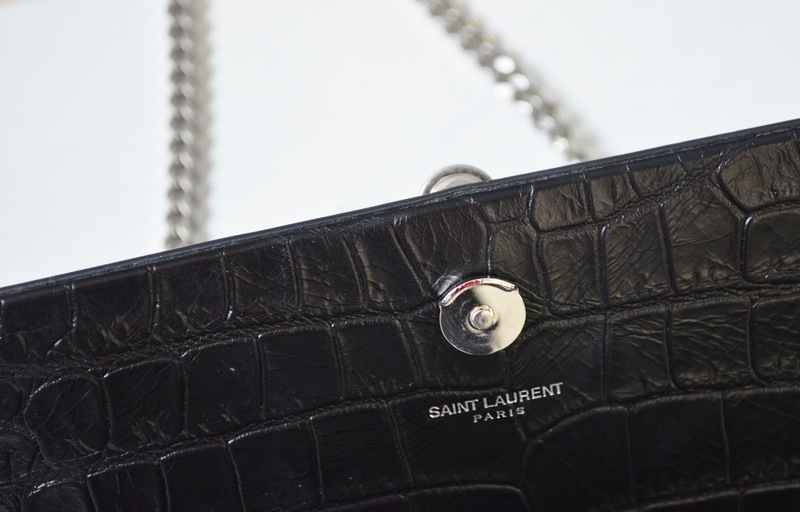 It features an interlocking metal YSL signature on the front, with silver chain and magnetic toned hardware. The attention to detail is impeccable. Now, for the actually useful part; how much stuff can you fit in it? I'll be honest, in my opinion it's not the most spacious bag. It probably looks more spacious than it actually is. 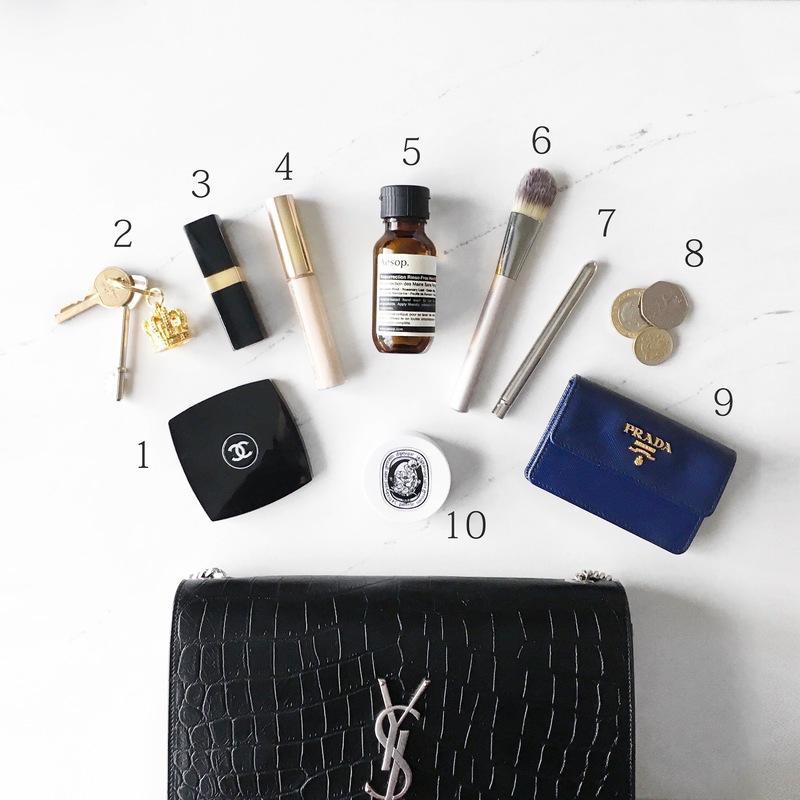 Don't get me wrong - all of the essentials fit happily, but I suppose after being so used to my Large Chanel Classic Flap Bag, I've become rather accustomed to be able to take all kinds of unnecessaries out and about with me. For instance, I can't fit my travel sized Tangle Teaser in here along with my make up bag, it's a one or the other situation, which I'm not used to. However, I do fully accept that carrying around a hairbrush is hardly essential. So, I am quite enjoying that aspect forcing me to be more discerning about what I carry around with me. I am truly loving this bag - but if I was forced to come up with a negative, it'd be the way the bag opens and closes. I want to give you my fully formed opinion, in case you're thinking of treating yourself to this piece and the way a bag opens and closes is actually really important to you. To open and close the bag, the whole front flaps open and shut, held together by a little round magnet (as seen above). The magnet is VERY strong - and I feel bad criticising this, as I certainly wouldn't want the bag to flap open in the breeze or spilling the contents, but sometimes when I'm trying to open it, I feel like I'm having to be a bit vicious with it in order to pry it open. Secondly, when closing the bag, despite the magnet being extremely strong, it doesn't pop together with great ease. It's not always a smooth closure; you really have to get to know the exact position of the magnet in order to line them up perfectly. I'm used to it now, but initially I did just fold the bag shut a couple of times only to later realise that the popper and the magnet hadn't properly met, leaving the bag not totally secure. Overall, the bag is very sturdy; much sturdier than I expected. 3. Favourite Rouge Coco lipstick. 8. Free roaming money - I'm always forgetting to keep change on standby for parking. Overall, I am of course utterly thrilled to add this piece to my collection. It seems to go with every outfit and works for day and evening looks. I will certainly treasure it for years to come. Wow, what an amazing gift! I'm sure you'll get a lot of use out of it ^^. Haha, I totally have the same image as Erin, hilarious. You MUST do a post burning some $$$ now just to fulfill this expectation, haha!